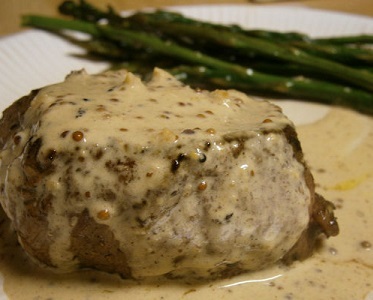 Brandy Steak Butter over a tender steak ...yummy! Steaks served with special flavored butters can really make the meal memorial. The brandy butter not only adds flavor, it adds elegance to the entire meal. 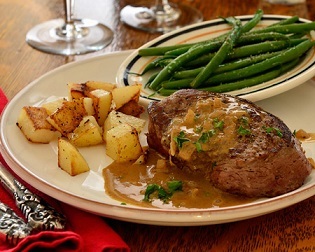 This restaurant recipe for the steak butter is deliciously easy and you can freeze the compound butter to use anytime you want to enhance the beef you are serving. It truly is a favorite restaurant recipe. Preparation time: 15 minutes. Serves 8-10. If you wish to speed up the melting process, cut the butter pieces from the frozen log in advance of the steaks being ready and keep them at room temperature and then top the beef steaks when plating. Excellent job! Thanks for your interest in a restaurant recipe that works! Check out the other recipes on the website. Each one is a recipe that work ...each is a real restaurant recipe. Enjoy your steak butter and the company you share it with!